Being Busy Is Not the Same as Being Productive ‹ LinkNow Media | We're Hiring! The self-professed busy person: hurrying from place to place, dashing through doors, seemingly encircled by innumerable tasks and responsibilities nibbling at their attention like frenzied fish. The work never seems to get done, and although time and energy are plentiful, they aren’t infinite. Going through the motions of your daily routine, squeezing in unforeseen surprises, and finding time to keep learning can be thankless, but the busy person trudges bravely forward. 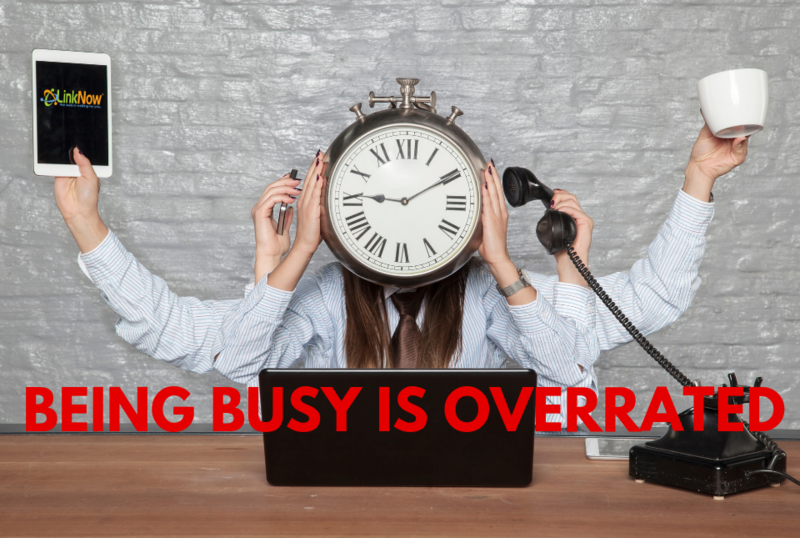 After all, being so busy must imply being productive…right? Not necessarily. Many are under the impression that busyness and productivity are, for all intents and purposes, synonymous. However, the two aren’t created equal, and while they overlap significantly, there are key differences. Busy people always look busy— and make a point to— while productive people go about their work swiftly and in silence. While productivity guarantees busyness, the opposite is not true. In other words, busy people talk the talk, and productive people walk the walk. Productivity, by definition, implies producing— finishing work you can step back and admire— whereas busy can look like a full schedule with little to show for it. While the goal is ultimately to achieve the correct combination of both virtues, let’s observe the ways that being busy and being productive may differ in everyday scenarios. Being busy might leave your daybook and calendar bursting at the seams. However, in spite of having your days filled, your work may not be leading anywhere meaningful—or anywhere at all. Productivity demands a method to the madness. Work without a final goal is just toil— a means to an end. While the busy individual is content to toil away at time-consuming tasks, the productive individual is satisfied knowing that each undertaking is part of a sequence leading logically to the next. That’s why the truly productive person sets concrete, specific goals that are not only ideal but attainable. We all know the importance of order amidst chaos. Not all of one’s daily activities carry the same weight of importance. There are only so many hours in the day, and responsibilities can’t be done all at once, but rather one at a time. Being productive means being able to distinguish quality from quantity, depth from breadth. While the busy person rushes through tasks, perhaps at the expense of thoroughness and precision, the productive person dedicates a proportional amount of time and energy to every task they perform. A routine means someone different for everyone. Like resolutions, creating a routine is simple enough—the trick is sticking to it. While there is salvation in a schedule, many individuals are thrown off when the schedule changes. Whereas busy people hurl themselves aimlessly into the next task, the productive person approaches each challenge mindfully and matter-of-factly. A productive individual knows the importance of having a routine, yet retaining the flexibility to take each day as it comes. How many times this week have you heard, “I can’t, I don’t have time?” from a well-intentioned but thinly-spread busy person? It’s an easy, albeit lazy excuse that many utilize. However, rather than denoting a packed schedule, it more often suggests poor time management. The productive person understands that no one has time, but rather, one makes time for the people and duties that they deem important to their life. The next time you have a truly busy day, ask yourself if it was a truly productive day too! If you can give a confident affirmative to both, you are well on your way to living a busy, productive, and deeply rewarding life!